1. WHAT CRITERIA MUST A PERFUME FULFILL TO BE CONSIDERED PREMIUM? When designing a fragrance for a premium collection, I select the most refined, elegant and unique ingredients my perfumer palette offers me.2. WHAT DOES PREMIUM MEAN TO YOU? 3. 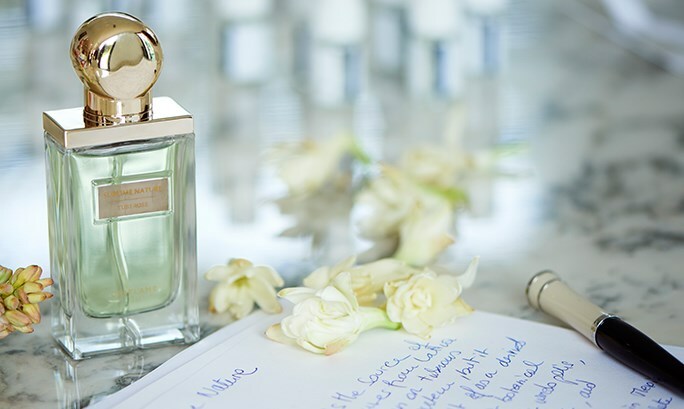 WHAT MAKES SUBLIME NATURE TUBEROSE AND TONKA BEAN PREMIUM? I crafted Sublime Nature Tuberose and Tonka Bean from sublime extractions of ethically harvested Tuberose from India and ethically harvested Tonka bean from Brazil. Also, I have put the ingredients at the center of the fragrance, making them shine. 4. HOW DO YOU GO ABOUT DEVELOPING A PREMIUM SCENT? 5. YOU SELECTED THE BEST, MOST ICONIC INGREDIENTS FOR THESE SCENTS. HOW DOES THE SELECTION PROCESS WORK? Tonka Bean is an Amazonian treasure that unveils its multiple gourmand facets with vanilla, almond, cinnamon and caramel tonalities. It has a deep, warm and intense character. It’s difficult to harvest and has delicious olfactive notes that make it one of the most beautiful ingredients of perfumery. The idea of designing a highly refined scent inspired by nature was a true novelty. 6. WHEN CREATING THESE SCENTS, YOU AIMED FOR SMELLS THAT OCCURE AT SPECIAL MOMENTS IN TIME. WHICH MOMENTS? For Tonka Bean, I chose the moment when the bean dries in the sun after the monsoon rains. This crystallization phenomenon gives the Tonka Bean its most opulent and intense scent. It has a warm and smoky smell, faceted with bright watery transparent notes. 7. HOW WOULD YOU, A MASTER PERFUMER, DESCRIBE THE SCENTS OF SUBLIME NATURE TUBEROSE AND TONKA BEAN? Sublime Nature Tonka Bean is sensual, but also fresh. It has a watery feeling, at the same time it’s quite intense. Very feminine, caring and sophisticated.